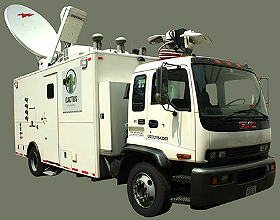 Cactus Film & Video, which has been providing broadcast facilities to news teams since 1996, is expanding in its home base of Mexico City with the purchase of a SNG truck. The company told TVZ: "Since we created our Fiber teleport, we received plenty of demand for SNG trucks in the region. That is the main reason why we decided to bring this unit to Mexico. The truck will be based in Mexico City and can be deployed anywhere in the country. We are starting with this one, and can get additional units if needed with local partners." Cactus, which is currently building other broadcast facilities in the Americas, is planning to create a fleet of between three and five SNG trucks over the next five years.